Delivering the keynote address, Ester Martinez, CEO & Editor-in-Chief, People Matters, urged upon the need to broaden professional network, learn, and experiment to become future-ready. 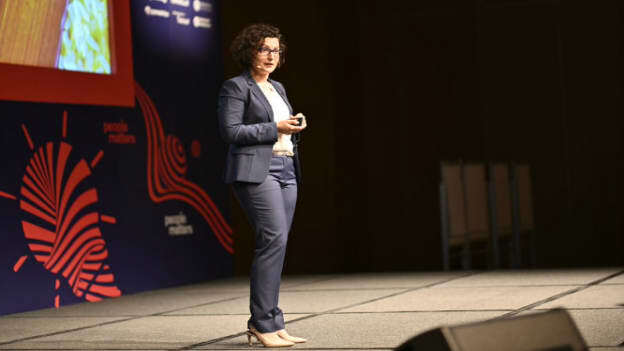 “In the last 200 years, there have been more inventions than in the last 200,000 years,” said Ester Martinez, Editor-in-Chief and CEO, People Matters, opening the 2019 TechHR Singapore Conference. While the internet helped revolutionize business models, artificial intelligence is expected to be a much bigger force for change in the coming days. A PWC study predicts that AI, robotics, and smart automation technology could contribute up to $15 trillion to global GDP by 2030. That’s approximately the GDP of China and Japan put together. Technology is also radically impacting the nature of jobs. McKinsey predicts that by 2030, 75 million to 375 million workers (3 to 14 percent of the global workforce) will need to switch occupational categories. The report also suggests that historically the net impact of technologies on jobs have been creation of 10 percent of total employment over four decades. “We are living at a pivotal time of business & workforce transformation,” Ester notes. The questions today for business leaders is not about the ‘why’ or the ‘what’ but really about the ‘how’. How do we define our business strategy in this context? How do we change and adapt to this new opportunity, as change is exponential? How do we find relevant talent and train existing staff to the new occupations required? What can we do to get future-ready as leaders ourselves? To complicate matters, the answers to these questions vary from one company to the other as the context is different and the environment is continually evolving. It is to help HR professionals navigate in this context that People Matters TechHR Singapore 2019 was conceptualized, she said. “It is our contribution to the community on building your own contextually relevant ‘how’ answers,” Ester added. Shifting the mindset from what’s required to what’s possible is to deeply acknowledge that “you will be a newbie forever,” as Kevin Kelly, the author of the inevitable puts it, she added. Setting the context for the agenda, Ester highlighted the four content tracks: 1. TECH-AS-THE-GLUE focused on technology for productivity, and alignment through the employee life-cycle. 2. THE-FUTURE-IS-NOW: Focused on harnessing emerging technologies that could enable disproportionate leaps in work efficiency. 3. DIGITAL-FORCE: Building future-ready digital organization and 4. HOW TO-DIGITAL: Accelerating your effectiveness as a digital transformation leader. Apart from engaging the audience with thought-provoking ideas, the opening note also featured engaging exercises which helped the audience reflect on their own approach to thinking about new ideas. To read more stories on TechHRSG, click here. NEXT STORY: Fourth Industrial Revolution: Where do Indian Executives stand?